I joined the SCA in college. The SCA did not have children in the late 1980’s. I guess parents dropped out until their children were much older. I got married in the year 2000. My children were born in 2003 and 2006. A lot had changed in the SCA in 15 plus years. It is now 2014 and even more things have changed in the SCA. 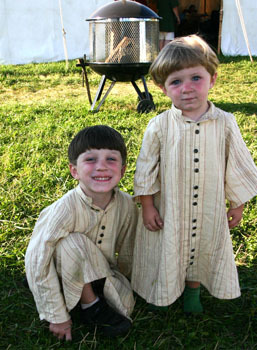 It is now common to see children at events. There are children’s activities. Parents do not have to drop out of the SCA until their children leave home for college. I hope that my family has been a good example of how to bring children to an SCA event. It has not been easy and about the time you figure out one thing, something else changes and you are back to square one. This article is on how to deal with young children at an event. My children are mostly past these problem and solutions, perhaps it is time to write an other article on how to deal with elementary school aged children at an event.